Though at least one of the attackers had surveilled the hotel complex before the attack, it appears that the attackers were lost in finding their real target British Special Air Service (SAS) who were already in the complex. Ali Salim Gichunge (aka Farouk) was identified as one of the attackers. The woman he lived with him was identified as Violet Kemunto Omwoyo and referred to herself as an "al Shabaab bride". His mobile phone was registered using the name Ali Salim Gichunge and the vehicle used during the attack was identified as similar to the one used by Gichunge. Two women are being sought by the Kenyan police for probable involvement in the attack. Violet Kemunto Omwoyo, the wife of Ali Salim Gichunge, who is said to be among the five-member team that carried out the attack. So far, her alleged role in the attack remains vague and is a suspect by association to her husband, the alleged ringleader of the cell. Kenyan police believe she crossed into Somalia hours prior to the attack. The second woman is Miriam Abdi, who is suspected to have played a central role in the delivery of the deadly weapons used in the attack. There are no current photos of Abdi. CCTV footage of a yet to be identified attacker. The suicide bomber of Dusit D2 hotel attack was identified as Mahir Khalid Riziki, 25, born and raised in the Majengo area of Mombasa town. It was while attending prayers at Musa Mosque, Mahir met his recruiter, Ramadhan Hamisi Kufungwa, now in Somalia fighting alongside al-Shabaab. The Musa Mosque is a known recruitment center for al-Shabaab. 2014 Mahir was suspected of being part of an al Shabaab cell briefed to assassinate security personnel. October 2014, Mahir was accused of killing a police officer at the Royal Court Hotel. November 2014 Mahir fled to Tanzania after security agencies posted his photo as a wanted person. In 2015 Mahir relocated to Somalia possibly to receive al Shabaab specialist training. Sometime in 2015 Mahir returned to Mombasa. 13 January 2019, he moved into Mandera County (Kenya) and then to Nairobi to link up with the cell that executed the attack. He traveled to Nairobi on 13 January 2019, two days before the attack. Harun Maruf explains that Mahir Khalid arrived Dusit D2 hotel on his own, was communicating with the cell leader, Ali Salim Gichunge. It’s possible he didn’t know other attackers; Al-Shabaab brings attackers from different units to keep operational secrecy. A Canadian national, Abdihakim Guleid, has been detained in Kenya on suspicion he may be connected to the attack in Nairobi. Born in Somalia, Guleid's passport was issued in Edmonton. His Ontario driver's license shows an address in Etobicoke, in the west end of Toronto, Canada. According to his brother, Guleid was in Kenya on family business and he is convinced of his brother's innocence. The death toll of the attack stands at 20 and 5 attackers killed. The statement reinforces al Shabaab as part of the al Qaeda franchise opposing US foreign policy in Israel as well as an actual admission that the attacked failed in its objective in targeting the conference held and attended by US delegates (refer to related section in the Incident Report on the conference). Clearly Amniyat (intelligence structure of al Shabaab) lacked precise intelligence on the location of the conference and once the attacked commenced moved in randomly killing as many people as possible. The hostage taking that followed allowed al Shabaab the opportunity to gain maximum media exposure, keeping in mind that the Riverside complex has been known for its heightened security measures. It is no coincidence that the attack comes on the third anniversary of the al Shabaab attack on AMISOM’s Kenya military base at El Adde. Al Shabaab chooses to target hotels more than any other terrorist group in the world, often enlisting employees for access to routines and security of the hotel. It should be noted that DusitD2 is one of the few hotels in Nairobi that share neighbourhoods with three Western embassies, Australia, Netherlands and Germany, making it a popular spot for Western diplomats and affluent Kenyans. A few weeks prior to the attack, a Toyota Ractis would be driven to the hotel and parked by the roadside. A hawker at the junction of Chiromo Road and 14 Riverside Drive claimed he had noticed the car several times. According to the hawker “They would normally park by the roadside and no one left the car. And when they did, one would go and come back with coffee from the restaurant”. Two days before the attack, a waiter at the restaurant said to the media that one of the attackers, with a “big scar” on his hand, went to the restaurant and ordered coffee. On the day of the attack the assailants arrived at the restaurant, armed. For approximately 30 minutes, the assailants never left the vehicle and then drove towards the drop arm barrier on Riverside Drive. Soon after one of the attackers executed a suicide bombing inside the hotel launching the attack. The attackers then began shooting their way into the compound past the second barrier where they hurled grenades at the guards. On 15 January 2019, a suspected al Shabaab attack that includes an armed assault and bombings was executed at the Riverside hotel complex (Dusit D2) in Nairobi, Kenya. According to eyewitnesses 4 occupants of a white Toyota gained access to Dusit D2 hotel, Nairobi and opened fire. The armed assault reportedly followed twin bomb explosions. 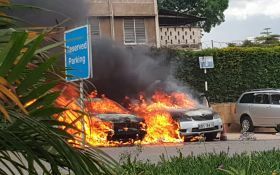 On 15 January 2019, at approximately 17:00LT, identified reports indicate that police spotted at least six gunmen inside the hotel complex, and three burning vehicles in the area of the hotel complex. Reports indicate that officers from the Recce squad, a special forces unit of the General Service Unit (GSU), entered the hotel complex in order to engage with the gunmen. Students from the University of Nairobi who reside in nearby buildings were also evacuated. Moreover, according to media reports, the spokesman for the Somalia-based terror group al Shabaab claimed responsibility for the ongoing attack. Media reports indicated that police detonated a vehicle which they stated had explosives located inside at the hotel complex. Police moved away from other vehicles in the area that are suspected of having explosives inside. However, police officials stated that the security operation inside the hotel complex continued with reports indicating that one suspect may have been arrested. Among the first to respond was a British SAS trooper, who served in Syria. He was reported to have been out shopping nearby when he heard about the attack and kitted up with equipment in the back of his car before heading to the scene. The Dusit is one of the highly guarded areas in Nairobi. Blocks in the hotel provide accommodation to an NGO like the Somali Stability, UN related agencies. and Qatar airways. Dusit has reinforced steel and glass doors, and with most the hostages barricaded behind the doors, the terrorist could not reach them. According to the information received by the UNDSS that is now being verified, a number of locations in Nairobi have been attacked in the past hour by armed attackers. The situation remains volatile. We have received reports that at approximately, 1600 hours (LT), an explosion took place at 14 Riverside drive. Thereafter, gunmen entered the I & M bank and shot persons inside. They subsequently entered the Secret Garden restaurant and began shooting occupants at this restaurant. They then proceeded to the Dusit hotel . An eyewitness, has stated that the persons appear to be Al Shabab militants. The Host country authorities have cordoned off the area and trying to engage and neutralize the assailants. We have commenced a headcount and the telephone hotline has been established. Riverside drive is approximately, 5 Kms south of the UNON HQ complex. All UN facilities have been notified and are closed. Today, 15 January is the 3rd anniversary of the El Ade attack on the Kenyan AU forces." We regret to confirm that at approximately 3pm today, a group of armed assailants attacked the Dusit Complex in a suspected terror attack. Security and emergency teams immediately responded to the incident and have cordoned off the area.The situation is being managed and residents are being screened and evacuated from the area. We are aware that armed criminals are holding up in the hotel and specialist forces are now currently flushing them out. However we regret to inform that there have been injuries in the attack and we are in the process of confirming the numbers and types of injuries incurred. We have been vigilant throughout the holiday season and therefore all public and other hotel premises remain under close watch. Reports from throughout the country indicate that everything remains calm and normal. We urge the public to remain calm and to cooperate with all security forces and to provide any information that they may deem as useful to the security forces. We thank you for your cooperation. Further information will be provided as soon as it is available. The attack comes on the third anniversary of the al Shabaab attack on AMISOM’s Kenya military base at El Adde. Irrespective of heightened security measures at hotels in Mogadishu, attacks are generally abetted by al Shabaab sympathizers employed at hotels, allowing al Shabaab unfettered access to who is present at hotels as well as security measures in place. Combined with al Shabaab's ability to execute sophisticated attacks, hotels will remain vulnerable. According to an official Somali dossier report on the attacks, security gaps such as the lack of bomb-detecting scanners and sniffer dogs at entry checkpoints around Mogadishu are still problematic. It should be noted that the attack comes on the third year anniversary of the 15 January 2016 attack by Al-Shabaab militants against a Kenyan-run African Union Mission in Somalia (AMISOM) base in El Adde, Somalia. The attack, which included 150 - 300 al Shabaab militants, resulted in the death of over 140 Kenyan Defense Force soldiers. It was the deadliest attack against AMISOM forces in Somalia and the deadliest for the Kenyan military since independence in 1963. In addition, the attack comes as three suspects charged for their involvement in the Westgate terror attack in 2013, Abdi Liban, Abdullah Omar, and Hussein Hassan Mustaf, are set to stand trial. The suspects appeared at the Milimani courts on 14 January and their case is set for 21 January. The suspects had been charged with conspiracy to commit terror attacks, aiding terrorists and possession of materials linked to Al Shabaab. Adan Dheq was set free. Left to right, Hussein Hassan Mustafah, Adan Dheq, Liban Abdullah Omar, and Mohamed Ahmed Abdi, who are charged with aiding the gunmen involved in the Westgate Mall attack in Sept. 2013, appear during their ongoing trial at Milimani court in Nairobi, Kenya, Dec. 20, 2018. (Source: VOA NEWS). Furthermore, the attack occurred at the same time of a US conference(function) at Gem Suites, with approximately 180 US citizens attending. It seems that al Shabaab did not know the exact location of the conference other than at the Riverside complex, hence the attack on the Dusit hotel. As with the Westgate attack in 2013, the objective of al Shabaab remains one to put pressure on Kenya government to withdraw from Somalia and to intimidate public opinion in Kenya in supporting such a withdrawal. With recent US drone strikes against al Shabaab in Somalia, the attack could also be seen as retaliation of al Shabaab fighters and killed during drone and air strikes. Al Shabaab presence in Kenya remains a threat as it evades security force deployments. Similar to the situation in Somalia, Shabaab cell presence has seen a shift in targets whereby both citizens and security personnel are attacked in the Mandera and Wajir counties. These attacks not only had to the intent to kill, but also to access weapons and ammunition, and with that a message of a presence not likely to be erased from the counties. Al Shabaab has also increased its propaganda efforts regarding Kenya. Along with a video release on February 2016, Al Shabaab published two videos depicting attacks on Kenyan security forces in the Lamu region. In a video release in February 2016, The leader of an al Shabaab branch in Kenya, Ahmed Iman Ali, explained the reasons for continued attacks in Kenya. He referred to the continued involvement of Kenya forces in Somalia as well as what he refers to as crimes committed by Kenya forces against local communities. A Statement released by al Shabaab on 11 June 2016 explained several attacks as one of revenge against the Kenyan government's continued "systematic persecution of Muslims in East Africa". The statement by al Shabaab added that the Kenyan government actions against Muslims are supported by "informants who were deeply embedded into the fabric of the Muslim society". Such collaborations resulted in the identification of accused spies who were publically executed, Abdullah Faraj and Jared Mokae Omambia. Al Shabaab pipeline of support from foreign countries declined significantly since the announcement of the Caliphate in 2013, forcing the group to seek fighters in neighboring states like Kenya. Al Shabaab presents a classical case of where state instability enabled an environment for a terrorist group to fester, strengthen and presents itself as a "better alternative for existence" to the populace. It is not only about social change within an order, but the implementation of a complete new state ideology that allows al Shabaab to regenerate new alliances (i.e. tribal communities) and associations with the people of Somalia. In Somalia, the confluence of three factors cannot be ignored in explaining al Shabaab's existence: the failure in providing human security, political weakness, and ineffective state capacity (for more on social disintegration and terrorism refer to Susan Fahey & Gary LaFree (2015) Does Country-Level Social Disorganization Increase Terrorist Attacks?, Terrorism and Political Violence, 27:1, 81-111, DOI: 10.1080/09546553.2014.972156). The severity of a Somali state in search of social cohesion and control is evident in the manner which al Shabaab is able to persist not only with attacks, but also creating alternative government structures. Al Shabaab does not necessarily have popular support in Somalia, but those rejecting its ideology, tactics and forced recruitment simply lack a state capacity and societal cohesion to object. Hence, a situation of silent acquiescence for survival or official exploitation (read corruption and irregular activities) to serve individual interests has become institutionalized within society. Individual and/or tribal associations and bonds have replaced hope of a Somalia in the process of becoming a consolidated functioning state. Al Shabaab presents no better alternative, is extreme in behavior and does not shy away from viewing citizens being killed as collateral damage. Yet simultaneously, time has allowed the group to become a permanent feature of the Somali landscape, integrating into local communities and even convincing some sectors of community life that its executions are just. Hence, the execution of people not adhering to its ruthless ideological behavior is sold as the outcome of a court proceeding and/or the paying of taxes carries with it the benefit of security, not to be found anywhere else. President Kenyatta gives a press conference 17hrs later. About 700 hundred persons evacuated safely from the riverside complex. Kenyans reassured to go back to work with no fear and that normalcy should return. All the attackers have been confirmed EKIA. (Enemy Killed In Action). Casualties: Identification papers show 11 Kenyans, an American and Briton were killed, 2 remain unidentified.